My husband and I came here for lunch. I indicated my dietary restrictions when making our reservation, and mentioned them to the host when we checked in. We arrived a few minutes early, and were seated right at our reservation time. Our table was right up by the aquarium, which was pretty cool. Our waitress came out and took our drink order, then told me a chef would come out to speak with me shortly. When the chef came out, I already had an idea of what I wanted, so I asked if the Grilled Mahi Mahi could be done gluten-free. He said it could, and also offered me gluten-free rolls, which I accepted. They came wrapped up in their own little basket, which was marked to keep it from my husband’s non-gluten free rolls. They were warmed, and pretty good. The mahi mahi was the best entree I had on our trip. The shrimp were perfectly cooked, the fish was flaky and tender, and the sauce was wonderful. Even the garnish on top worked well with the other flavors, rather than just being decorative and superfluous. For dessert, I had the Chocolate Wave, a flourless chocolate cake served with raspberry gelato. It was one of the better flourless chocolate cakes I have eaten. Overall, this was a wonderful dining experience and we will definitely be back. 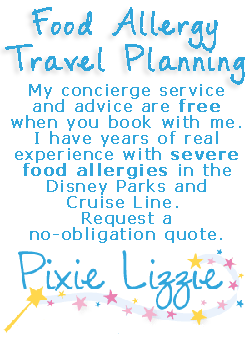 If you would like to review Coral Reef or any Disney restaurant, submit a food allergy dining Quick Review. We have another wonderful guest review from Tara Wolfe who shared her son’s dining experience with multiple food allergies. Kevin is allergic to milk, eggs, peanuts, all tree nuts and coconuts. 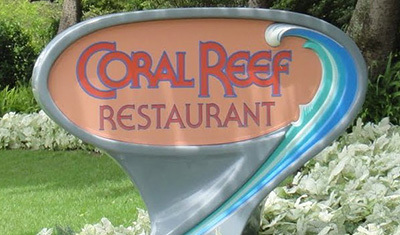 Coral Reef is such an interesting place to dine out. What first drew us to it was the location. Since it is right next to the Nemo ride, and having a 5 year old at the time, we were constantly on they ride and we had to try it. There were some mixed reviews on the food, but we have found it to be a great place for some wonderful seafood. The main attraction is not the food, however. It is the huge aquarium that takes up the whole wall of the restaurant. The layout of the dining room is wonderful. With different levels on which to eat, there is not a bad view of the aquarium. This last trip, we were able to request a table next to the water. This really kept our son occupied while my husband and I could talk. 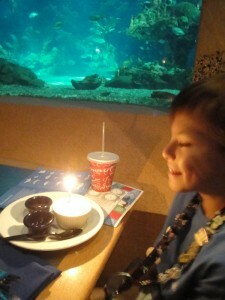 The hostess presented our son with a “fish finder” card so he could locate and identify all types of fish. Of course, this also lead to him looking for the fish he just ate, wondering if they just got it out of the tank! He had the Grilled Salmon with rice,green beans and carrots. For dessert he had milk free vanilla ice cream with safe chocolate sauce and sprinkles. It is a very relaxing atmosphere. As for non-food allergy food, I highly recommend the Seared Corvina Fish over Mushroom Risotto. My husband always raves about the Lobster Ravioli and Scallops. Ohhhh, what a wonderful dinner that was. As for advice on how to dine safely with food allergies, here are a few tips when planning and taking you vacation. We made Advanced Dining Reservations (ADRs) 180 days in advance, noting on the reservations that we had food allergies. We also contacted the Special Diets dept at WDW through email. 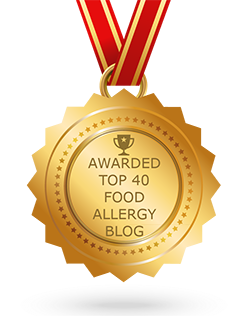 We filled out all the forms and faxed back with the (ADRs) listed and the food allergies in detail. Once we arrived at the restaurant, we made sure the Hostess had a note we had food allergies and which one they were. When we were seated, we mentioned the food allergies to our server who went to get the chef. The chef went over what he could have and let Kevin, our son, decided what he wanted to eat. If we had questions on any product, they would bring us out the ingredient label. Also, the chef should deliver the food allergy safe food, so that there is no cross contamination or mix up. The chef also came out periodically to check on us to make sure everything was ok. 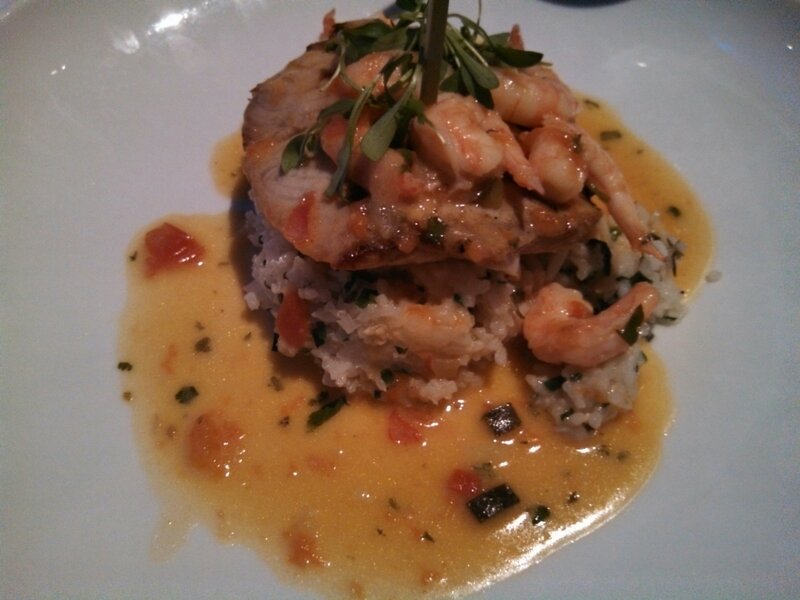 Thank you, Tara, for submitting this review of the Coral Reef restaurant in Epcot. You can read more about her experience on her blog at The Wolfe Pack. If you found this helpful, please be sure to give her a thumbs up and/or share this on Facebook.